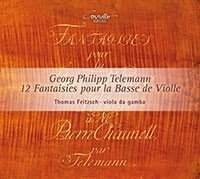 Last October it was announced that a copy of Telemann’s 12 fantasias for solo viola da gamba, known to have been published in 1735 but presumed forever lost, had been unearthed in a private collection by the gambist Thomas Fritzsch. Their apparent loss had been particularly galling because by 1735 the gamba was well on its way out of fashion, meaning that Telemann would have needed to pull out all his compositional stops if the pieces for this increasingly endangered instrument were to sell. So this premiere recording of the collection, performed by Fritzsch himself, feels like a big deal. The first thing to say is that, musically, these were worth the wait. Telemann presents a cornucopia of broken chords, unison and contrapuntal writing, passagework and even some plucking; there’s also a nod to the fashion tussle of the time between the fugal and the galant style, with Telemann employing a mixture of the two, much as Bach was to do a few years later with his second book of The Well-Tempered Clavier. Frustratingly, though, I can’t be as positive about the actual recording, because although the acoustic of the Klosterkirche Zscheiplitz (40 miles west of Leipzig) has lent a lovely balance of warmth and crispness, and although the notes themselves really dance into life under Fritzsch’s natural, joy-filled playing, this is an instance of close miking gone mad. First there’s the constant patter of fingers hitting wood, even added to at one moment by the ghost of approaching notes as Fritzsch’s fingers assume their positions (tr 3, 2'11"). Then there’s Fritzsch’s breathing, which contributes an unignorable whistling soundtrack to the whole. These performances would probably be immensely enjoyable in concert. On disc, however, Fritzsch has been let down.